Here's my Sunday workout, all nine minutes of one rotation of worksets. I like this workout-I will put it in my "library of workouts" for after my triathlon training is done! Were you using 8kg's for the double presses??? 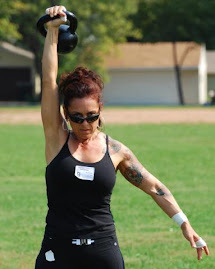 Can't wait to give it a try someday-thanks for the workout-I miss the hard kettlebell killings! I was using the 12's. The workout details were posted a few days ago, on Monday. It took a few days to get this video to download. Of course this and any of my workouts can be adjusted for your level of conditioning. I used the 12's and the 16, you can use the 8's and the 12. Still a killer workout!